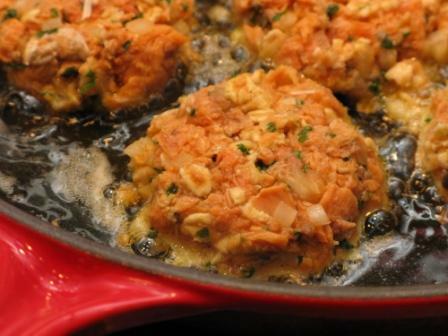 Calcium-rich Salmon Cakes from Good Food, Great Medicine (2nd edition - page 192). The recipe is below. Have you seen the recent research suggesting that calcium supplementation can increase the risk of heart disease? Here’s a brief overview. A recent analysis of studies in which calcium supplements were compared to placebo showed that those who took calcium supplements had a greater risk of heart attack than those who did not. Combined with the knowledge that calcium supplements have only a very small effect in preventing fractures due to osteoporosis, we see continuing evidence that our calcium sources should be food based whenever possible. This is a good way to bring canned salmon or tuna — or any leftover cooked fish — to the dinner table while shamelessly exploiting the weakness most of us have for hot fried things. These are golden brown and crispy, speckled with green onion, and lively tasting. You could serve them as appetizers if you made them smaller. Preheat oven to 200 degrees (for keeping fish cakes warm). 2. In a mixing bowl, beat eggs briefly with a fork and add lemon juice, green onion, seasoning, and oats. Add to fish and mix gently but thoroughly. 4. Heat 2 – 3 tablespoon of olive oil in a non-stick skillet over medium heat. Fry patties in 1 – 2 batches, about 5 minutes on the first side and 3 minutes on the second, or until browned and crisp. Transfer to a plate in the oven to keep warm. Serve with a side of Rich Yogurt Aioli (recipe follows) mixed with some minced green tops of green onions, if possible. ■ If using canned salmon, include the nutrient-rich skin and bones attached to the salmon. I just break them up with a fork so they are completely undetectable. If you tend to look sideways at canned salmon, try canned red Alaskan sockeye. It’s beautiful stuff, and worth the extra expense if it means you eat more salmon. Save drained salmon juice for Crowded Chowder on page 194. 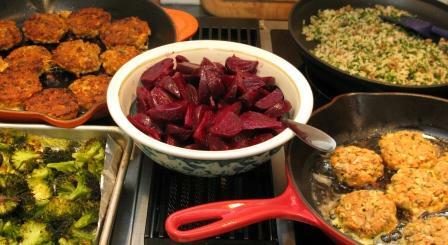 Try serving your Salmon Cakes with roasted beets and broccoli (see Roasted Vegetables and master recipe on pages 123 - 124, and roasted beets on 125 in Good Food, Great Medicine, 2nd edition) and perhaps a side of Nutty Brown Rice (page 172 ). Not included in this picture is the critically important accompaniment called Goop. Read on. This has always been known as Goop among family and friends. The name has neither dignity nor appetizing connotations, but it is what has become my culinary signature. Goop is a distant cousin to aioli (eye-OH-lee), which is the famous garlic-infused mayonnaise of the Provence region in France. In this version mayonnaise is a proportionately-small (although important) part of the sauce. Its main role is to provide richness. Yogurt provides the main character. The French would be appalled by the presumption, but in any case it is used as an aioli substitute in our house. It is thick and creamy when made with drained yogurt (see preceding page) and usually tongue-biting. Fresh garlic is the key to good goop. You can use more than the recipe calls for if you prefer to err on the side of yowza! You never know who might need to have their sagging immune system boosted. It should be added that there is nothing wrong with classic all-mayonnaise aioli. Mayonnaise made with good oil is good food. (See page 96.) We much prefer the taste of the yogurt version, however, and yogurt is an important food in its own right. Goop is especially good with roasted vegetables (page 123), steamed vegetables, raw vegetables, and salad vegetables — and goop can single-handedly justify the existence of the baked potato. It is also a fine sauce for fish (or any seafood, for that matter) as well as meat loaf or roast beef or chicken, or any rich meat dishes. Even though I call for 2½ cups of yogurt, the final volume is closer to 1 cup after it is drained overnight. Some folks (including me) enjoy goop made from yogurt that has only drained for a few hours; it is more refreshingly potent when its texture is not too thick. 1. Drain yogurt for at least 3 hours in a strainer lined with a basket-style coffee filter. (See Draining Yogurt following.) You will probably end up with a bit more than 1 cup of drained yogurt. 2. Stir remaining ingredients into drained yogurt and mix well. Store in the refrigerator. It keeps well for over a week but the garlic loses some intensity. It’s best when eaten within a few days. ■ The proportion of yogurt to mayonnaise may vary in either direction but there must be enough garlic to raise eyebrows, and enough salt and pepper to round out the flavor. The freshly ground pepper is very important; about 30 grinds should give you close enough to a half-teaspoon. ■ The longer you have allowed the yogurt to drain the thicker the goop. If you want the texture of thick ranch dressing, allow yogurt to drain just a couple of hours. avoid mass-market brands. Even the unsweetened and unflavored versions generally include ingredients like gelatin and cornstarch, which keep yogurt from naturally separating and create a smooth texture. Yogurt is best known as a good source of friendly bacteria that fortify the immune system, but it’s also nutrient-rich, calcium-rich, and protein-rich. Even people with lactose intolerance can usually eat yogurt because the bacteria that turn milk into yogurt gobble up a lot of the lactose in the process. Naturally-made yogurt begins separating as soon as you dip a spoon into it, and the draining continues until the yogurt is gone. Draining the whey from the yogurt gives it a thick, smooth texture that makes it much more versatile - and just as good (and a whole lot cheaper) than Greek yogurt. You can use it as a substitute for sour cream, or even cream cheese, if you leave it long enough. (It is sometimes called ‘yogurt cheese’.) Some even use drained yogurt as a replacement for mayonnaise, spreading it on bread and adding it to tuna salad. 1. Scoop 2½ cups yogurt into a 3-cup strainer lined with a disposable, basket-style coffee filter or even a paper towel. (You can also buy an official yogurt drainer in some stores.) Remember that additives like gelatin and cornstarch will inhibit draining. 2. Aim to drain the yogurt for at least 1½ hours on the kitchen counter or in the refrigerator, but for a very thick and creamy texture drain the yogurt in the refrigerator overnight. In 12 hours you will end up with a scant cup of yogurt cheese. Save the liquid that is drained off. Yogurt whey is tart and refreshing; I drink it, but you can also add it to soup or a smoothie. ■ If you sweeten the thick, drained yogurt with honey and soften the edges with a couple of tablespoons of cream, it is spectacular with fresh fruit or fruit desserts. Tor Hassell is grilling some natural uncured beef hot dogs. He loves operating the heavy equipment but prefers his sardines. His dad, Dr. Hassell, is on hand with the antioxidants. You are probably aware that there have been some ugly rumors out there about processed meats. Are they really associated with more cancer, heart disease and diabetes? Is bringing home the bacon really a good idea? Good question. So, let’s talk turkey. For example, there is a very recent paper published in Circulation, the flagship journal of the American Heart Association, which should make Subway very nervous. The authors analyzed 20 high-quality prospective trials involving 1,218,380 people in 10 countries, followed for as long as 18 years. Their purpose was to look for a relationship between red meat or processed meats and risk of heart disease or diabetes. Their findings are sobering for anyone who has bacon, sausages, salami, hot dogs, corn dogs, bologna, spam, ham, or sliced lunch meats in their refrigerator. You may be harboring fugitives. Read on. First, the researchers found no relationship between heart disease or diabetes and the consumption of unprocessed red meat, based on an average intake of a little over 3 ounces (100g) daily. This will seem startling to some people, who have been convinced that red meat is associated with heart disease. Recent studies even cast doubt on there being any cardiac risk with eating saturated fats! Second, the researchers did find a strong relationship between eating processed meats and heart disease or diabetes. For every 50g (a little under 2 ounces) of processed meat consumed daily, the risk of heart disease went up by 42% and the risk of diabetes by almost 20%. This analysis – perhaps the most complete to date – should give us a compelling reason to rethink our consumption of all preserved meats. We recommend avoiding preserved meat most of the time, with the exception of special occasions like February 29th, April Fools’ Day, Halloween, and National Hot Dog Day, which is apparently on July 23rd. On those occasions when you indulge in preserved meats, counter with an antidote of antioxidant-rich food. For example, if you’re eating a hot dog at a Labor Day picnic, follow it up with corn on the cob. If you’re serving yourself a slab of honey baked ham at a family reunion, find some broccoli or spinach to accompany it. If you are going to have bacon for breakfast, slice up a tomato to fry at the same time. Simple strategies with potential benefits. Happily for those of us who enjoy grilled sausages or hot dogs, not all of them are in the preserved meat category. Uncured fresh sausages – simply fresh spiced ground meat that has been stuffed into a sausage casing – are easily found at many local stores. The Painted Hills Natural Beef hot dogs in the photograph above have the sort of ingredient list to look for: beef, water, sea salt, honey, paprika, celery, and garlic powder. Yes, uncured meats do cost more than their preserved counterparts. So does good bread and good ice cream. Corn syrup is a cheap ingredient! If you want sliced turkey in your refrigerator for sandwiches, roast a fresh, skin on, bone in, turkey breast until the skin is golden brown and meat is a juicy 160°. Or roast a whole chicken and turn the leftovers into a one-dish meal like Southwest Chicken Couscous Salad (page 202 in Good Food, Great Medicine); or as a substitute for tuna in Tuna and White Bean Salad or Tuna and Broccoli Pasta (pages 189-190); or into a batch of Chicken Salad (page 105) to enjoy for a few meals. And remember, even real meat should only take up about one quarter of the real estate on your plate, which leaves lots of room for culinary heroes like vegetables and fruit, beans and legumes, and whole grain foods. The good news is that you can eat all the vegetables you want! Lots of them are tasty raw, a fine quality for a vegetable to have on a lazy summer day – carrots and celery, broccoli and cauliflower florets, cucumbers and tomatoes, either served with dip as finger food or tossed in vinaigrette as a salad. Then there are all kinds of great barbecue-friendly salads. Greek and potato, bean or lentil, rice, tabbouleh, barley or quinoa, and so on. 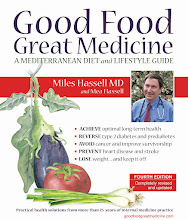 (See pages 134, 135, 161-66, 176, 178-80 in Good Food, Great Medicine). These are especially useful options for at least two reasons: you may discover a vegetarian in your midst, and you are less likely to go back for seconds in meat if you have a plateful of tasty – and filling! – food. A logical choice this time of year is Greek Salad. For one thing, it is THE time of year to eat sun-ripened local tomatoes, fresh picked cucumbers, and the mild Walla Walla onion. Also, it has very few ingredients (yay!) but the flavors of the rich Kalamata olives and the salty feta cheese set them off perfectly. Following is our interpretation. I suggest Roma tomatoes because they have more flesh and less juice, so are more likely to maintain their chunkiness in the salad. A mild onion is important in this salad — one of the sweet varieties like the seasonal Walla Wallas from Washington state, or Vidalias from Georgia, or Texas Sweets. Sweet onions from somewhere are available year-round. If you have only hot onion, make a different salad. My Greek salad needs plenty of onions, so they need to be mild. This is one of those recipes where every ingredient is critical. 1. Place vinegar, oil, salt, and pepper in mixing bowl. 2. Peel onion and halve lengthwise. Lay one half cut side down on cutting board and slice slim strips, no more than ¼ inch at widest point, from the rounded edge. (Cut strips in half if onion is big.) You will need 2 cups of onion slices, if onion is mild enough. Add onion to dressing in bowl and toss. 4. Quarter tomatoes lengthwise and remove bits of core, then cut crosswise into ½-inch slices. Add tomatoes and cucumbers to onion mixture. 5. Prepare kalamata olives (20 olives make about ½ cup) and feta. I prefer to use the larger quantity of feta, and slice it thinly so it crumbles and blends into the salad as part of the dressing. You may prefer to leave the feta in chunks. Add olives and feta to salad and toss. Mmmm. * If you’re not a feta cheese user already, start with a mild domestic brand made from cow’s milk. Don’t be intimidated by the use-by date – feta lasts an amazingly long time in the refrigerator sealed in its original package. Its rich, salty bite mingles with the dressing and is not at all intrusive, even for those who think they don’t like feta. * Don’t pit the olives over the salad! Being a bit sensitive about broken fillings myself, I count the pits — which look dangerously like quartered olives — before I add the olives to the salad. The more we study food and its components, the more evidence we see for the benefit of the whole food rather than supplements or extracts. We simply don’t know enough about what it is in any given food that makes it work. It may be that there is something in the combination of foods that creates some of the benefit. Choose whole food as your source of nutrients and fiber, as close to the original formula as possible. Don’t trust your health to man’s ingenuity or extraction processes. Too much may be lost in the translation. Supplements cannot replace good food, adequate sleep, and daily exercise. Be cautious of using nutritional supplements based on results of obscure blood tests or other controversial testing methods. Always be ready to ask for the evidence behind the recommendation, and examine that evidence to see if taking the supplement can be expected to lead to a clear-cut benefit. In my medical practice I use supplements only when there is a good reason. I treat nutritional deficiencies with supplements when I can’t achieve adequate levels with food. I use supplements in the absence of documented deficiency when there is reasonable evidence for benefit, and only on a case-by-case basis. We like to remind patients that most nutritional supplements are not natural and should be considered as mild drugs with potential for both benefit and harm, and not as food substitutes. When thought of in that way, nutritional supplements are used with much more discretion. Recent data concerning folic acid is a sobering reminder that relatively little is known about isolated vitamins. For many years it has been observed that a higher intake of folate from foods was associated with a broad range of health benefits such as less heart disease, certain types of cancer, and neural tube defects in pregnancy. Because so many people do not get enough folate through their diets, synthetic folic acid is used to fortify foods like cereals and breads, and folic acid supplements (such as in multivitamins) are often prescribed. So although we know folate is an enormously important micronutrient for many reasons, including preventing birth defects and the other benefits mentioned at the top of the page, folic acid supplements aren’t looking like the smartest option. A simple solution? Eat foods naturally high in folate frequently, and minimize foods fortified with folic acid. If you have any doubts as to whether you are getting enough folate, which is a particular concern for women who could potentially become pregnant, simply have your folate blood level measured. If you do take a folic acid supplement, we recommend you keep the dose to no more than 400mcg daily. Our favorite folate supplements? Warm Lentil Salad, Roasted Asparagus, Green Eggs and Rice, and Hasty, Tasty Hummus which can be found in Good Food, Great Medicine. People who recoil at bean salads can relax. Lentils have a peppery nuttiness and a disarming daintiness that allow them to slip under the radar. Furthermore, this is possibly impossible to dislike. As well as being simple and relatively last minute (lentils cook in about 30 minutes), this recipe is very forgiving. You can substitute your own choice of vegetables, like green onions and sweet red bell peppers, or just minced onion. It’s an especially good dish to have ready when you’re expecting to feed a group that may include vegetarians. Personally, I like to make enough for me to snack on for a week. 1. Rinse lentils, and then combine with the water and the tablespoon of salt. 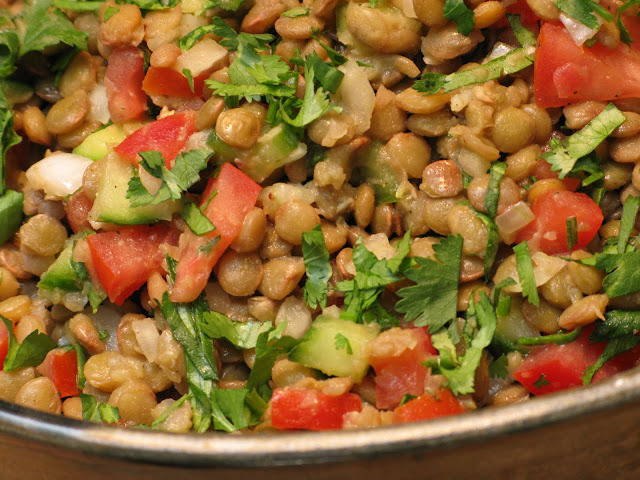 Bring to a simmer and simmer until lentils are tender, 30 – 40 minutes. (Check after 30 minutes.) You should have about 4 cups of cooked lentils. 2. While lentils are cooking, combine vinegar, olive oil, garlic, seasoning, and onion in a mixing bowl. Set aside until lentils have finished cooking. Drain lentils in a colander. Add hot, drained lentils to dressing and onion mixture and toss thoroughly but gently. Set salad aside for about 15 minutes to marry flavors, tossing once or twice. 3. Add cucumber, tomato, and fresh cilantro, if you have it. Toss again. Serve hot, warm, or room temperature. Like any type of bean salad, this begs to be part of a buffet. It pairs nicely with something like Marinated Carrot Matchsticks, also found in Good Food, Great Medicine. Sadly, we need to use good sense when eating chocolate. This means we should choose high-potency dark chocolate, which means a cocoa content of 70% or higher. If the label doesn’t specify a cocoa percentage, find one that does! As for the recommended daily allowance, up to three ounces a day have been studied, but one ounce a day (or even less) should give you adequate cardiovascular benefit. And if you are adding chocolate to your diet, remember to remove some calories somewhere else. We’re glad you have read this far, because we want to talk about a food that’s even better for your heart than chocolate. We want to talk about – beans! We look for any excuse to speak up for beans because they are usually not appreciated when they try to speak for themselves. There is no bean lobby to represent them in the corridors of power because beans are too honest to mix with politicians, and too cheap to make anyone rich. Beans are, however, possibly the most effective – and certainly the safest – lipid lowering agents you can find. For example, one half-cup daily of cooked pinto beans can lower LDL (‘bad’ cholesterol) 8% or more. (Other legumes are probably equally heroic, but it was the pinto bean that was studied here. One of our favorite ways to study the pinto bean is on the dinner plate pictured further down.) If an 8% reduction doesn’t seem like much, look at it this way: the bean effect is similar to doubling the dose of most ‘statin’ cholesterol lowering drugs, but without the cost or risk. ...and by the way, the benefits of beans also extend to reducing your risk for diabetes and cancer, particularly breast cancer. In the Nurses Health Study II, a serving of beans or lentils twice a week was associated with a 24% reduction in breast cancer risk. Just think about the reduction in health care costs if more prescriptions were written for beans! ■ A daily dose of 10 grams psyllium (about 2 heaping teaspoons) can sometimes reduce LDL by about 7 percent. In some studies, psyllium has failed to lower LDL but has had a beneficial effect in raising HDL and lowering triglycerides. Most people stir psyllium into water or juice. A method that works well is to stir it into a small amount of water, drink it quickly before it gels, and then follow with 12 ounces of water. Psyllium is a great anti-constipation agent, too. ■ About two handfuls of raw almonds (about 30 almonds or two ounces) daily can reduce LDL by 9 percent. Raw walnuts, hazelnuts, Brazil nuts, and pecans probably work as well. Adding raw nuts to your diet also has the important benefit of reducing oxidized LDL as well as another risk factor called Lp(a). Remember that whenever you add a high-calorie food (like nuts) to your diet, you need to reduce calories elsewhere. ■ About 6 ounces of eggplant or about 3 – 4 ounces of okra every other day can also lower LDL. These foods have not been studied by themselves, but when used in combination with other factors, have been found to lower LDL by 28 percent. Inflammation was reduced as well. ■ Soy foods modestly reduce cholesterol. These are probably best included in the diet in the form of whole traditional soy foods such as soybeans (edamame), tofu, miso, and tempeh. (See recipes for Seductive Soybeans and Tofu in Soy Ginger Marinade on pages 158-60 of Good Food, Great Medicine.) I am less enthusiastic about the highly refined soy products like soy milk. For those who use soy milk because of dairy intolerance, read the ingredient label carefully. Some other beans also lower LDL to a similar degree, particularly pinto beans. A half-cup of cooked pinto beans or 25 grams of soy protein will lower LDL 5 percent or more. ■ There are a variety of stanol-containing margarines that can lower LDL cholesterol. I don’t tend to recommend them because of concerns over the problems with hydrogenated oils in the margarine, and the debate over whether stanols at these doses have potential for harm. Time will tell. Wondering what to feed the cardiovascular system you love? We suggest Mexican Brown Rice (recipe below) and Avocado Salsa. These recipes can be found on pages 175 and 131 of our cookbook and lifestyle guide, Good Food, Great Medicine. This is a last-minute one-skillet dinner that also offers complete protein in the bean-and-rice partnership. If this recipe didn’t taste so good, you might suspect some other reason for its existence, like nutritive value or ease of preparation. It is at its best freshly made, but it still makes lovely leftovers. If you are struggling with excess weight or diabetes, we suggest that you replace a cup of the rice with an extra cup of beans. 1. Heat oil in 10-inch skillet over medium high heat and sauté onion, chili powder, cumin, and salt for about 5 minutes. 3. Add rice, lemon, pepper, black beans, tomatoes, and cilantro. Toss gently, breaking up any lumps of rice, until the mixture is hot throughout. (Check to make sure there’s enough salt – you may need to add another ¼ teaspoon.) Serve and eat while steaming hot. If you use chopped fresh tomatoes, use plenty – they have a milder flavor than the canned, and their fresh juiciness is a lovely addition. Make sure you add them just before serving, if possible — cooking tends to turn them to mush.